Dr. Jeremiah McClure brings a high level of education and experiences to the Middle Georgia area. Dr. McClure grew up in the area and has lived here most of his life. He was a standout soccer player – playing his way through the youth ranks in Dublin to Stratford Academy to successful careers at the NCAA Division I level at Georgia Southern and in the professional ranks in the United Soccer Leagues. 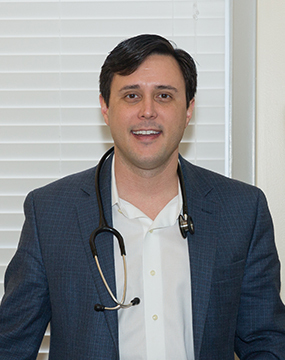 Dr. McClure studied at Georgia Southern University and matriculated to Mercer University and finally to residency at the Medical University of South Carolina in Charleston. He has been a physician at Internal Medicine Associates in Macon from 2011-2013 and served in the same capacity at the New Hope Clinic in North Carolina before deciding to open his own practice. He continues to be an active member of the community as a soccer coach in the local youth leagues.